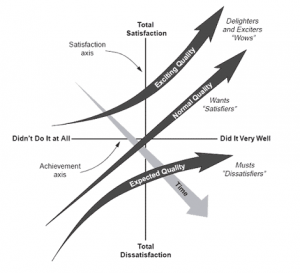 I copied this graphic – a representation of the Kano Model – from a newsletter I received. It’s a fine graphic that takes a while to comprehend, but I am not convinced that it does a good job of communicating what it means to. So, let me explain. There are three basic levels of product features and customer satisfaction levels. Silverware. In a restaurant, you must have these products in adequate supply to even serve customers. If they are not available, customers are dissatisfied, and the necessity of these items are such a given that you get no credit for having them in the first place. Think of the last time you saw a tractor with no wheels, for example. Hamburger. This level represents those services and products that meet customer needs; you perform them adequately or even better than adequately; the product is often in abundance, and it’s what people expect for the product. Think hamburgers. A McDonald’s double cheeseburger feeds your hunger, but it doesn’t give you a world-class dining experience. Steak. This level represents features that most customers don’t even know they want, until they see them on your product. It meets a need perfectly and creates excitement and demand for your products. Think cars with backup cameras when they were first introduced. So, here is the interesting part. Depending on where the customer and competition is, the same feature can be silverware, hamburger. or steak. For example, when backup cameras first came out, they were something drivers didn’t even know they wanted until they saw them. Back then, they were steak – big, juicy, rare tenderloins. Now, however, they are standard – they are silverware, hamburger at best. That’s the beauty of using our proprietary six-step Empathic Method. 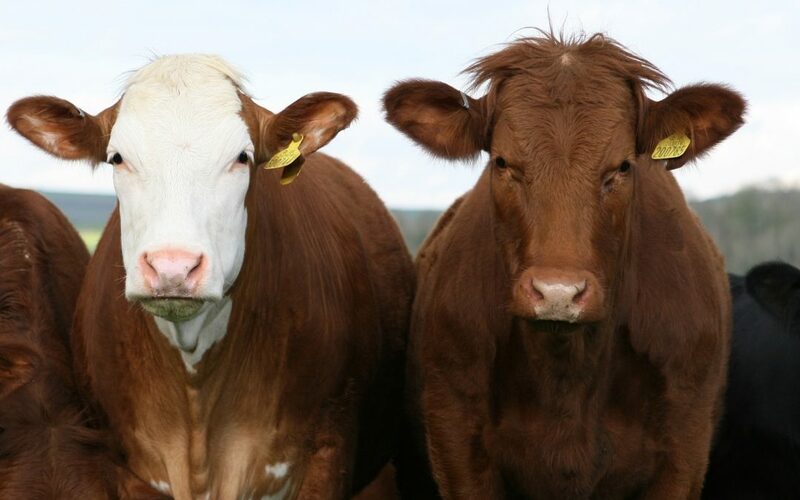 We help you identify customer needs that lead to steaks – a product that customers seek out and pay more for, because they have something that the market didn’t even know it needed, until it had arrived. Mind you, sometimes steaks don’t come easy. They can require design, engineering, and marketing to make them happen. On the other hand, some steaks are as easy as a choosing a different 50-cent part. I’ve heard about corporate budget trimming that eliminated a 50-cent part, which then cost the company 100% of its sales, because the product wasn’t usable for its main purpose anymore. Empathic listening helps us understand the customers’ needs and how that translates into products your customers want, need, and buy. Wouldn’t you like to know what would excite your customers and prospects to buy more of and pay more for? And discover what you can’t change because it will throw you out of the market altogether? I invite you to use our diagnostic survey to find out what makes the most sense for you. Using Millennium’s proprietary Empathic Method, we reveal the farmer’s decision-making process by taking their whole personal framework into account, not just one particular decision. The result is deeper insights, more meaningful marketing messages, and faster sales growth. Contact us to learn more.